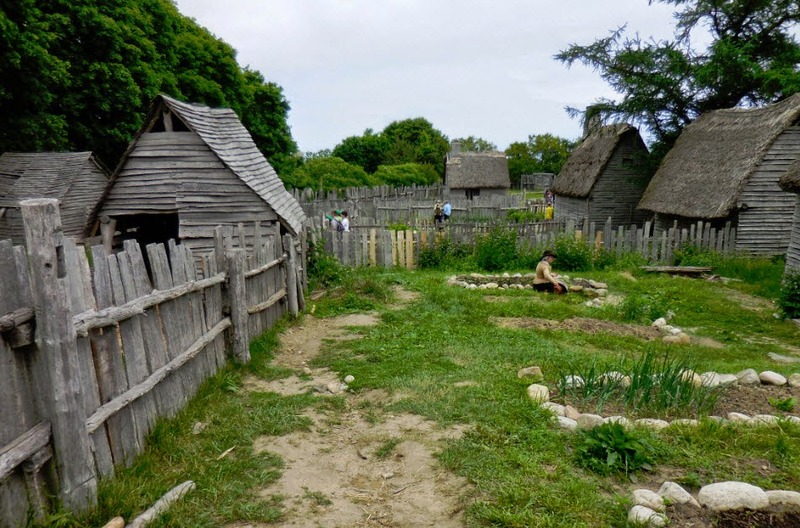 This year I visited Plimoth Plantation in Plymouth, Massachusetts. 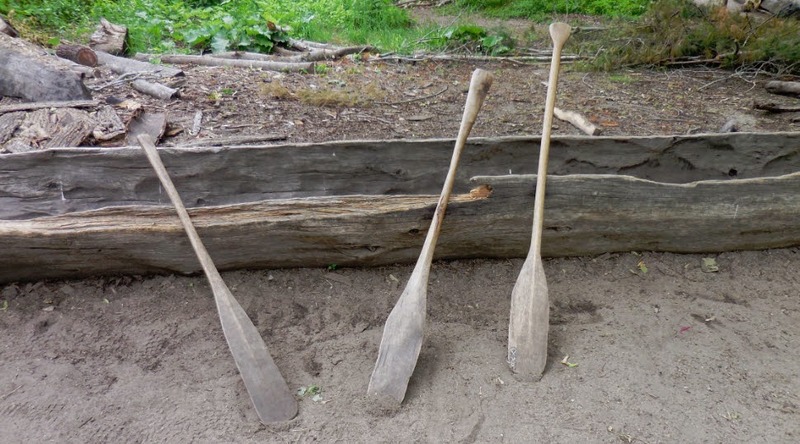 I have not confirmed that any of my ancestors were on the Mayflower, but there are a few possibilities. 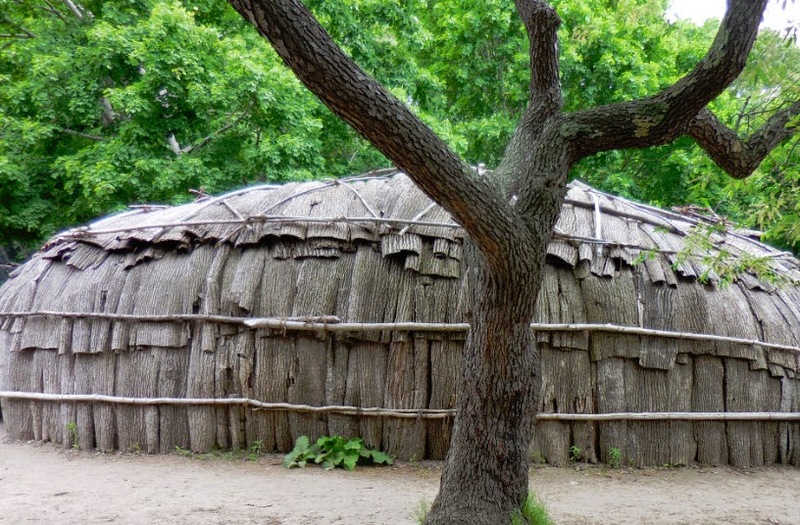 Even if you don’t have people in your tree from this area, Plimoth Plantation is a great way to spend the day. We purchased our tickets at the Visitor Center and dashed past the crowds of school children. Our first stop was the Wampanoag Homesite. The workers in this section are Native people dressed in clothing worn in the 17th century. They are happy to answer questions about their history and culture. 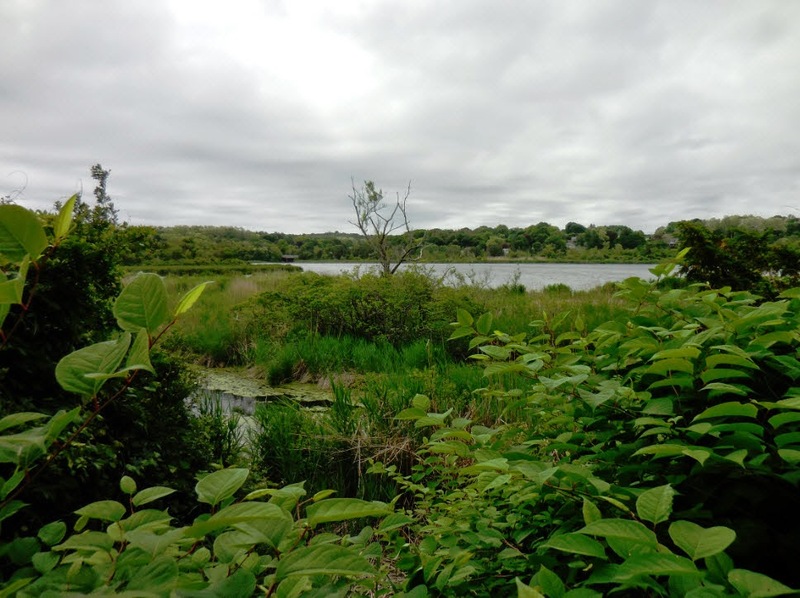 After leaving the Wampanoag Homesite, we followed a path that overlooked beautiful Plymouth Harbor. We arrived after a few minutes at the 17th-Century English Village. I adore living history museums. Here, the costumed village folk assume roles of the original residents. They are trained to act as if they are truly Pilgrims in the 17th century. The man in the photograph below was building a beanstalk. He told us about his family and why some members left England due to economic hardship. 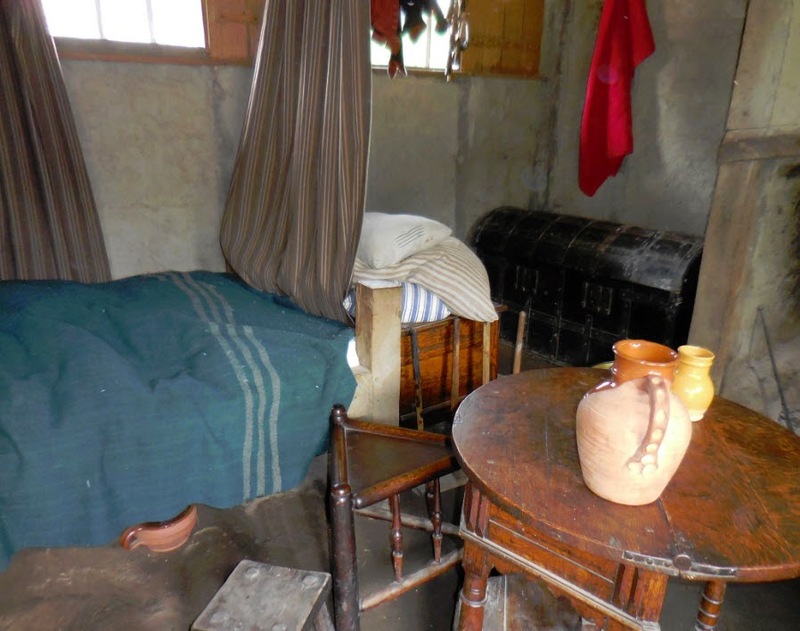 The photograph below shows a home that was being built by a colonist. 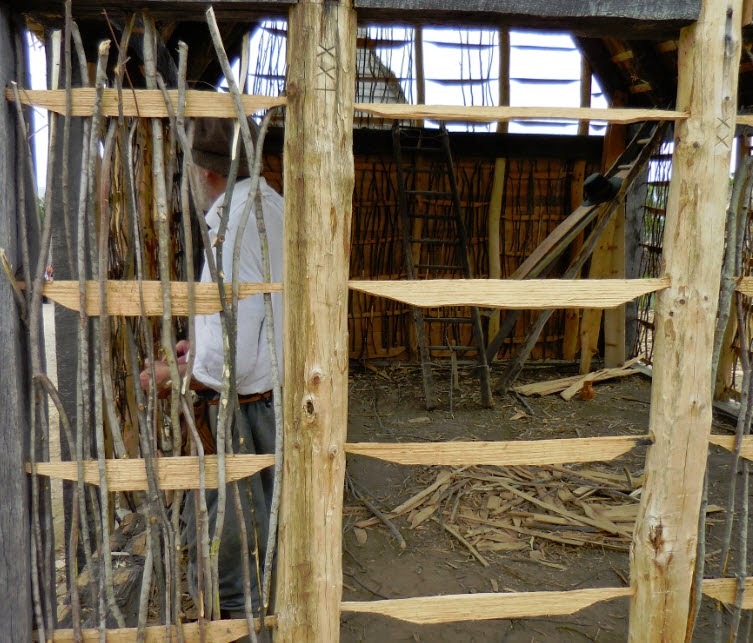 They started with small sticks and then layered mud and grass to insulate their homes. The harsh New England winters must have been dreadful. These were very tough people. 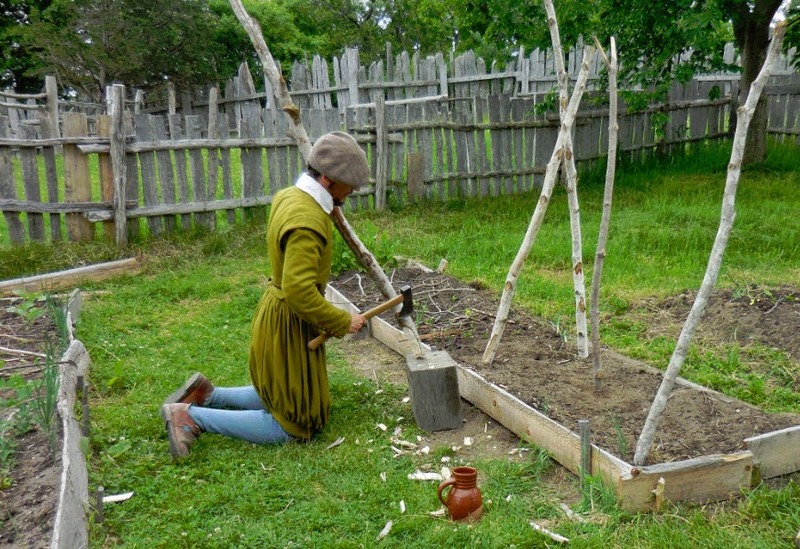 The following photograph shows a garden being tended by a woman. We asked her many questions, and she replied in great detail about the types of plantings, her family and life in the village. 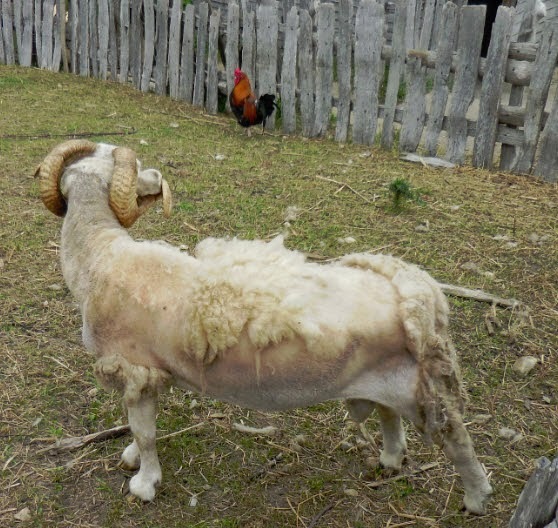 I enjoyed looking at the farm animals throughout the village. Click here for more information on the animals. 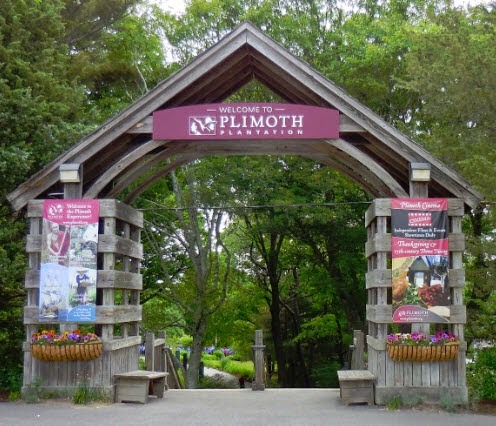 There is also a Craft Center at Plimoth Plantation, but it was being renovated when we visited Plimoth Plantation in May. 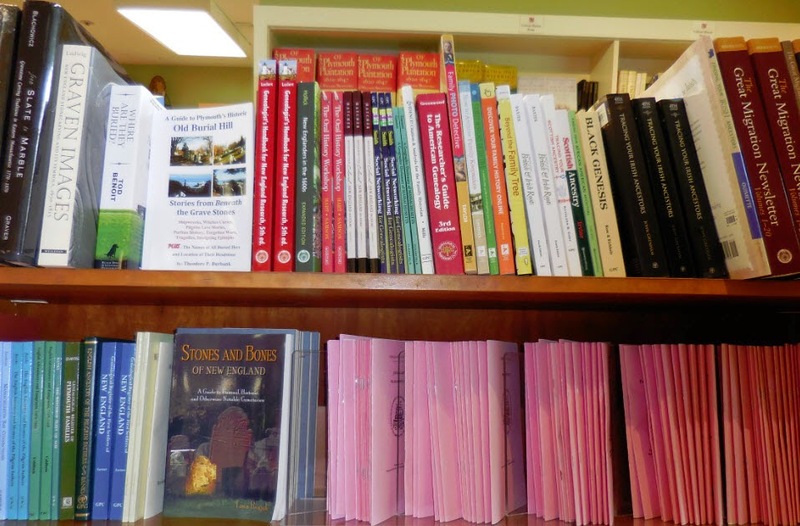 We headed back to the Visitor Center and entered the fabulous gift shop filled with books. 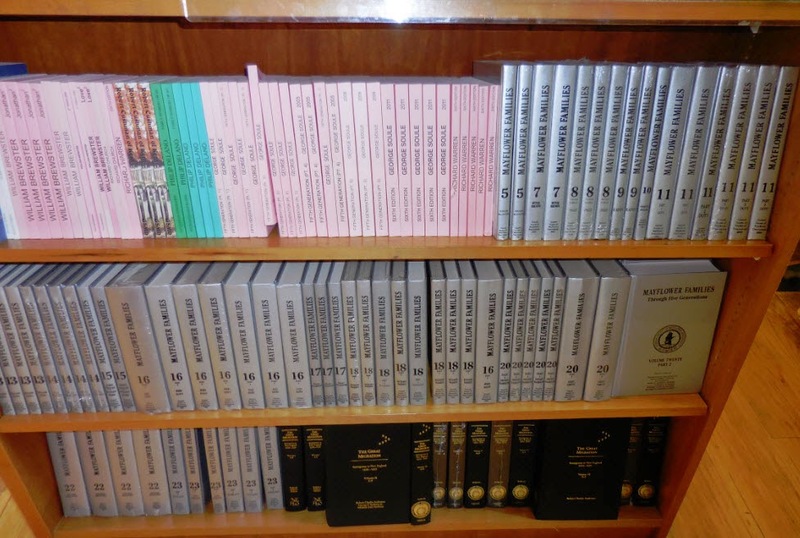 Genealogists and family historians can spend a small fortune here. 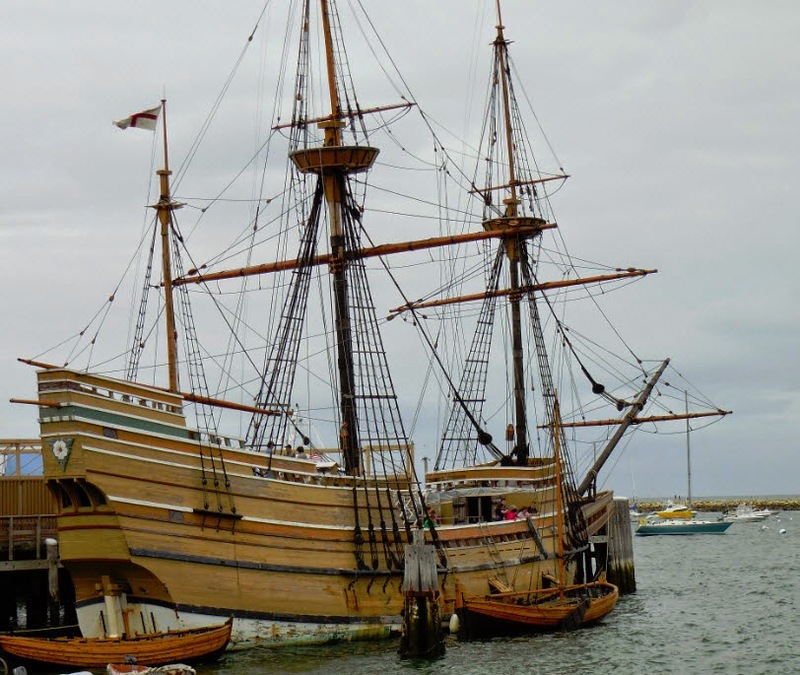 We next walked to our car and drove a few miles to the harbor to see the Mayflower II, a replica of the original Mayflower. We were able to board the ship and speak with the costumed Pilgrim character actors. Imagine their journey on a crowded and small ship. It was nothing like the cruise ships we enjoy today. I admire the bravery and tenacity of the Pilgrims. And, of course, we had to see the famous rock. Below are photographs of the enclosure that houses the rock and then a closeup of the rock itself. 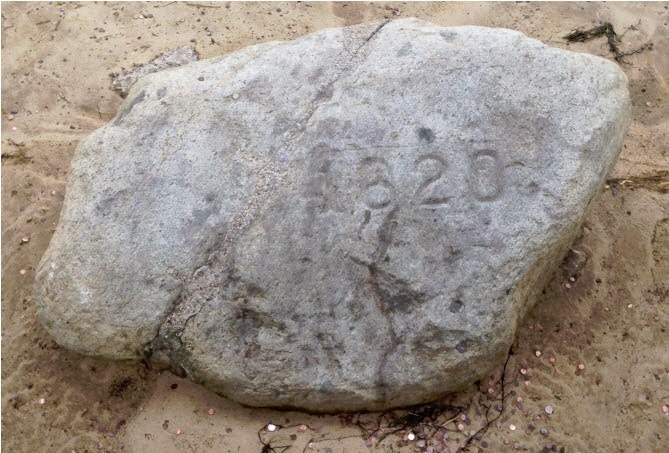 Click here for more information about Plymouth rock. 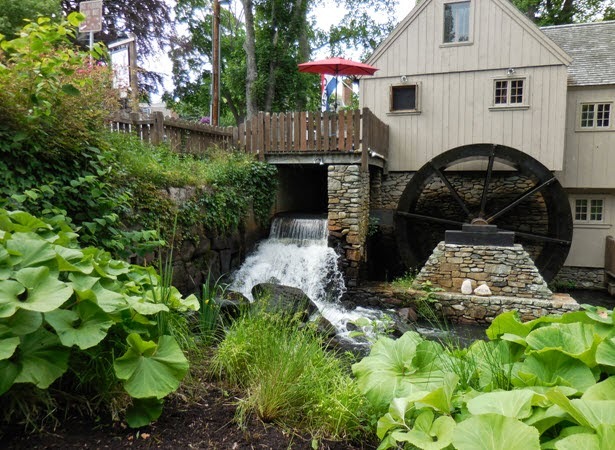 We then headed up the hill past lovely homes and scenery toward the Plimoth Grist Mill. We were fortunate to have perfect weather the day we visited. The town is magnificently maintained and very picturesque. 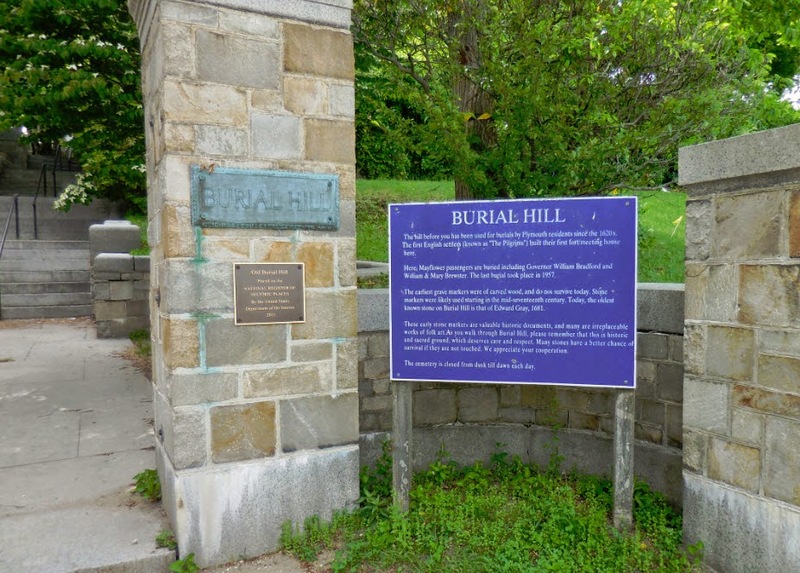 Unfortunately, we did not have the strength to explore the cemetery at Burial Hill. Maybe next time! 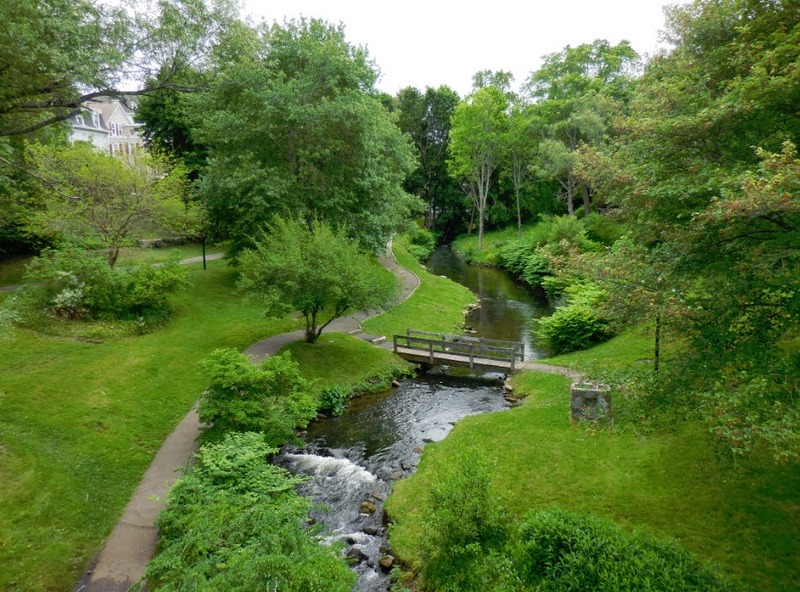 You have to visit Plymouth. I only scratched the surface of the sites to see. It truly deserves more than one day’s exploration. 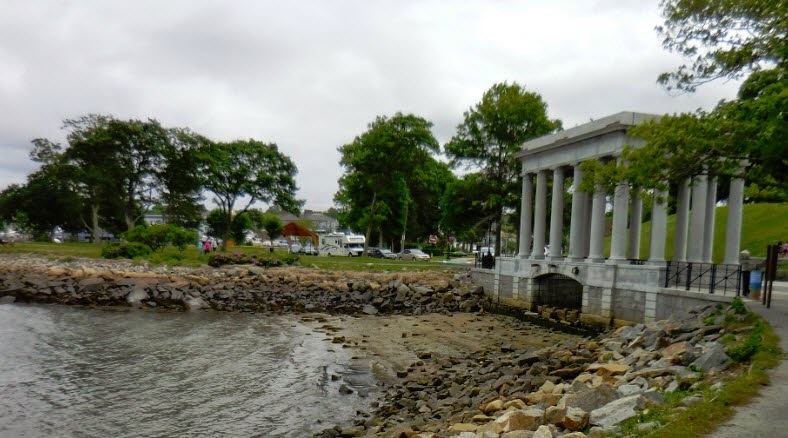 (1) Wikipedia (http://www.wikipedia.com), “Plymouth (Massachusetts),” rev. 8 June 2014. Thank you for this information. 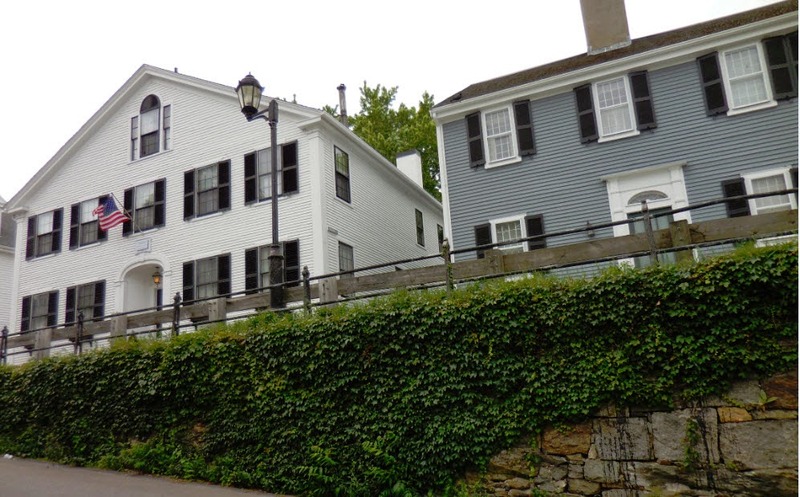 Plymouth is on my list of places to visit. Thanks, Jody. My list of places to visit is very long--there's not enough time in this life. 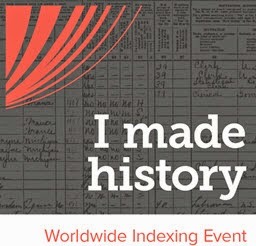 Every time I discover an ancestor, I want to travel to his or her home town.